Even though I cooked this dish last weekend, my writing about it today makes it the perfect conclusion to the bacon trilogy (trilogies aren’t just for fantasy novels). So we’ll pretend that I used my newly-smoked bacon instead of a slab of locally produced commercial product. came to my rescue. As I read the recipe I realized that the entire first half, which took the most time and effort, was nearly identical to the trotter gear recipe I had used. 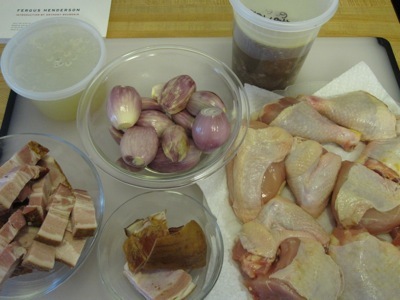 So with more than half of the work already done, I assembled my ingredients: a quart of trotter gear, a pint of chicken stock, twelve whole peeled shallots, a whole chicken (broken down into ten pieces), and a pound of slab bacon cut into chunks. Henderson calls for the bacon rind, but my slab was rind-free. Fortunately I had ham rinds in the Deep Storage Facility, and used those instead. 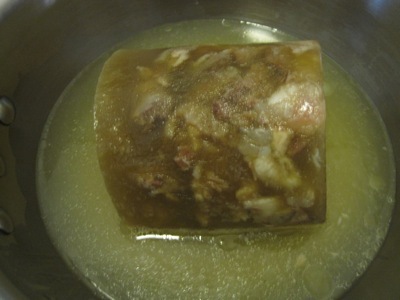 I added the trotter gear to a pot with the chicken stock. Even at room temperature, the gear was a solid slab of pig jelly. 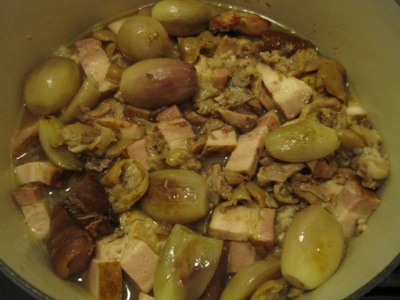 While the stock simmered and the gear dissolved, I browned the ham rinds and shallots in a bit of duck fat. 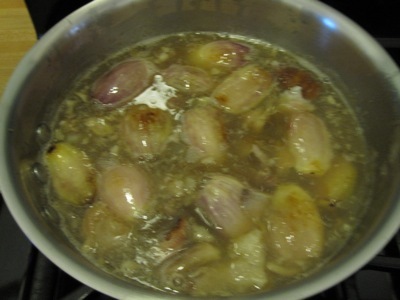 When they were thoroughly browned I added them to the simmering pot. 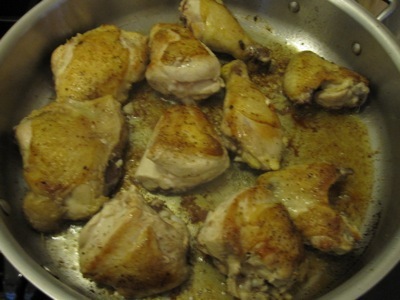 While the pot simmered for another half hour, I browned the chicken in the same pan I used for the rinds and shallots. I moved the chicken to a dutch oven, covered it with the bacon chunks, then poured the sauce over everything. 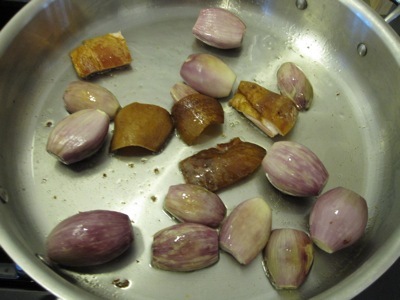 The covered pot went into a 425 °F oven for forty minutes, then another ten minutes uncovered. The sauce reduced slightly, and everything browned a bit more. I served the chicken with mashed Yukon Gold potatoes, green beans with lemon butter, and a loaf of bread to soak up the sauce. 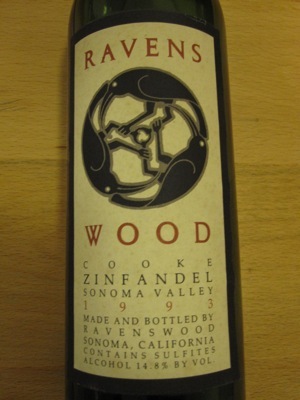 I paired a hearty zinfandel with the dish, a ’93 Ravenswood Cooke from the Belm Cellars. The chicken and bacon, not to mention the porky bits from the trotters, were meltingly tender. 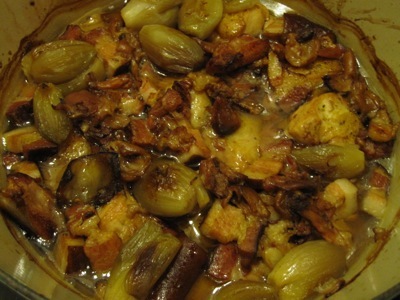 The sauce had a mild sweetness – from the shallots and the Madeira used in the trotter gear – which mellowed the smokiness of the bacon and ham rind. Why bother with coq au vin when you can eat this? 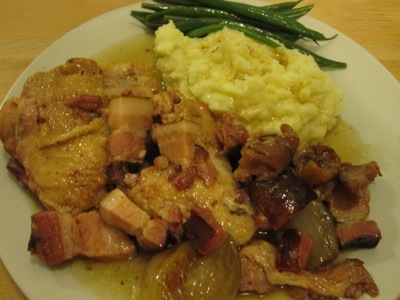 Now that I know how simple it is to prepare, and as long as I have a supply of bacon and trotter gear, this will be my go-to winter chicken dish. Please fedex some immediately. Dear lord this looks delicious. Sorry, we had the leftovers last night. But now I know what to cook for you if you ever visit. I am going to visit if you cook that for me!